Marcus Can Blog by crisn is licensed under a Creative Commons Attribution-Noncommercial-Share Alike 3.0 Philippines License. Click the RSS icon to subscribe! Funny, liposuction is actually 3 words with a message: Control your LIPs Or badly need SUCTION. Email message: I was about to ask you last Sunday na pumayat po kayo (you have lose weight)…Do you need prayers? I don’t know how my other friends and immediate family will think once they see me because other than losing weight I am starting to sport a longer hair with the goal to get that ponytail back (I will try if I can find a pic) which I had when I got married and maintained until around 2004. Let’s see this Christmas vacation once I am home and and which is also when I’ll know if I can fend off food that will be abundant this time of the year. Few more days, time’s fast. The long thanksgiving weekend in the US gave me another time to spend with Marcus. With my wife out of town to have her scheduled check-up–-also a disguised parenting day off–and with Marcus still needing to attend school, it was just me and him from Thursday until the weekends. During this whole time I assumed the entire alpha role at home including cooking – rice and anything fried. If I am not mistaken this must be the longest time I ate the most fried food in just a matter of few days, not by choice but by the lack of it. And so today, Sunday, after just taking for breakfast the leftover we had last night–-fried meatloaf AND fried rice, I am looking forward to Batangas where I imagine myself having something green and leafy. Our recent father-and-son time made me discover something. Firstly, I can live unplugged. To focus on Marcus’ exam review as well as to spend more time playing with him after, I denied myself access to Wi-Fi and bedroom TV. Other than having more quality time (some usual quibbling in between), I have also proven that without these electronics inside our room, our son is able to be in bed earlier than before. This time he didn’t breach the 12 midnight period. But if I can continue this, is now a big question. Secondly, I realized that with the absence of wifey at home, Marcus and I would be 24X7 fast food customers. At first the thought of meatloaf and hotdogs seem exciting but just after two meals I began to accept that I am way past that enjoyment kids (and to mention that my birthday is approaching and I’ll be a lot older by then) get when they hear that sizzling sound the frying pan makes. In fact, if by some stroke of luck, wifey will be away for another day, I’ll likely grab one of those recipe books in the shelf and force myself to cook one that doesn’t have oil. Oatmeal breakfast: both a confession and a penance. Have had sinful diet in the recent days, from wifey’s baking (like her Christmas cookies and one that’s ongoing which involves cream cheese) and the dine outs at work (with female colleagues who seem to have a different idea when they say that they’re on a diet). And with the holidays fast approaching, the trend is likely to continue thus the challenge in appeasing the palate while keeping my waistline in check could be a tough one. Thankfully, there’s always the reliable oatmeal to the rescue though honestly, I really think that it is one boring meal just like any vegetable. Be calm.No need to censor. But I’m trying not to say this dreaded F word – FATS; because right now I’m facing a tough problem. Tougher than the impending unemployment and tougher than facing an unending oil price hike. It has something to do with my weight. And the horrifying number is Seventy pounds. That’s how heavy I am right now. And that’s seven pounds more than my required weight. In gym lingo I’ve reached the hated plateau. It’s no matter how much I do the tread mills, do weight training and perform hopeless crunch and abs work out, my body just got bored with these routines. And like an employer running out of manpower, my body has posted a vacancy sign outside its doorstep. It’s accepting fats and calories like Vietnam is accepting all the multinational companies. I know I can’t do anything about Vietnam but I’m sure I can do something about this weight. A battle must take place though to achieve once again my ideal weight as I don’t find it amusing anymore seeing our bathroom scale displaying a value higher than the last time I stepped on it. So instead of crying over spilled beer…I mean milk, I’d like to write about this new weight goal so I can get back to it soon and feel good about losing – weight, that is. For me to be back on track, a re-assessment has to be done like anything that has gone awry or in this case what I’d call SNAFU – Situation Normal All Fat’s Up. Got to go back to monitoring what I eat and when I eat. I have to say goodbye to Jollibee breakfast, goodbye to Burger King Whopper, goodbye to heavy dinner, goodbye to beer…ooopps, let me recall the latter. As part of my reflection, I’m wondering what I have done recently that made me accumulate such weight. So let me focus at least on this past week’s activity. Monday. As scheduled, I played badminton with a couple of colleagues. Although known as the fastest game and tagged by some as a good cardiovascular workout, I find this game as a false sense of exercise to complement a diet. Why? Normally, the heart-pounding and blood-pumping game for the whole day will bring us to a fast food restaurant to recover what we skipped during lunch. This last game, we found ourselves eating spaghetti and having a couple of beer in The Old Spaghetti House. Fats – 1. Diet – 0. Sunday. I was in Batangas with wifey to attend a birthday and a farewell party. The Red Ribbon chocolate cake and the predictable spaghetti were there and were looking mouth-watering as ever. I must have blacked out in front of the table but I found my stomach bulging and my lips colored brown and red. Fats – 2. Diet – 0. Saturday. Finally, I attended my first TUP-V summer outing after several postponed dates with my batch mates. So right after a hard day’s work (at least I believe so), I find myself worthy of rewarding myself with good food and good company. Without wasting time, I excitedly drove my way from Cavite to Sta. Rosa Laguna; and a hundred wrong turns and a couple of hours later (thanks to the perfect map), I eventually located Dictado Resort where most of the attendees also got lost which is probably the reason why the program started late. Despite the exhausting drive it was fulfilling to meet long lost friends, schoolmates and other new alumni. 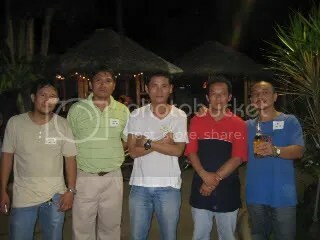 It was also nice seeing some of the faces behind the aliases in the Tup-Vian’s yahoogroups. It was a “tagalog-free” night and it was like being home in Bacolod with everyone around speaking Ilonggo. The feeling of nostalgia is of course never complete without guess what? Beer. Lots of it. Ti abi. Fats – 3. Diet 0. Friday. Coming from work, I picked my wife at home and went back to SM to watch the most anticipated movie of this year – Indiana Jones and the Kingdom of the Crystal Skull. I don’t know if the peanuts we brought inside was responsible for my calorie pile up that night OR was it the film being the MOST boring (sorry, I can’t help but emphasize) Harrison Ford and Steven Spielberg film I’ve ever seen – it was so boring, my metabolism almost stopped working. If I haven’t seen any of their previous works, I could have included them in my “never-to-watch-films” list. Watching Indiana Jones is like watching a chopsuey of films such as X-files, Tomb Raider, Alien vs. Predator, Armageddon all rolled into one. And that’s not a compliment either. Anyway, peanuts or this B-movie film, Fats – 4. Diet – 0. Thursday. Failing to bring home something to eat after my shift ended, I asked my wife for a dinner at the nearby David’s Tea House. Meal was picked to have the least calorie content that we can think of. I ended consuming the dumplings that my wife did not eat. By the way, did I mention I had beer that night? Well, I did. Fats – 5. Diet – 0. As much as I’d like to add more days in this list, it’s becoming more obvious that my Diet is losing the battle. I can imagine a fictional referee raising the Fats’ hands after winning the unanimous decision for the 5-rounder battle. But the fight is not yet over, my Diet is calling for a rematch and I’m making sure we will win next time.